Earlier this week, China launched the first of several ships being designed for Malaysia following the conclusion of a defense deal between the two sides. The development highlighted some of the ongoing activity in the bilateral defense relationship following the entry of a new Malaysian government in the country last May. As I have noted before in these pages, while China and Malaysia have been making gradual inroads in their defense ties as part of their wider relationship over the years – including through the establishment of new consultative mechanisms and exercises – one of the notable developments for this aspect of ties came in 2016, when, under the previous government of Prime Minister Najib Razak, Malaysia agreed to buy four littoral mission ships (LMS) from China. The event was a landmark development for defense ties as it constituted the first naval purchase deal of its kind between the two countries. 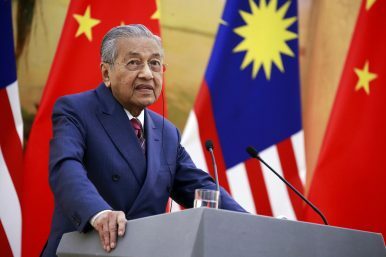 Despite some initial questions raised about the nature of China-Malaysia relations under the new Malaysian government following the shock election victory by the country’s opposition last May and the return of the country’s longest-serving prime minister, Mahathir Mohamad, the deal has been proceeding thus far amid some changes. As of now, the contract amount has been reduced downwards to about 1.05 billion ringgit, with all four ships to be built in China, as opposed to an earlier arrangement where two would be built in China and two in Malaysia. This week, the deal was in the headlines again with the official launch and naming of the first of the LMS vessels. The vessel, named Keris, was launched and named by the wife of Malaysian Defense Minister Mohamad Sabu acting as a “Lady Sponsor” in a ceremony on the morning of April 15 at the Shuangliu Manufacturer Base of Wuchang Shipbuilding Industrial Group in Wuhan, China. Per the official account provided by the Royal Malaysian Navy (RMN), the Keris, which was given the pennant number 111, was launched in the presence of various Malaysian and Chinese officials as well as personnel, including those from the RMN, the Boustead Heavy Industry Corporation (BHIC), China Shipbuilding Industry Corporation (CSIC), and the China Shipbuilding and Offshore International Co Ltd (CSOC). As of now, is expected to be delivered to Malaysia around December 2019. The RMN cast the ongoing deal as being not only a significant one in the context of its own history, but also a symbol of how Malaysia and China could advance their broader collaboration, including diplomatic and economic components. As the deal continues to progress amid the other developments in Sino-Malaysian relations under the Pakatan Harapan government, it will be interesting to see how this actually plays out in the months and years to come.